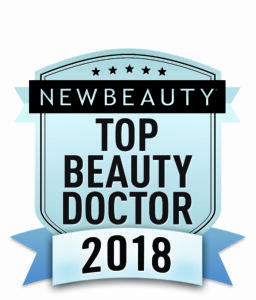 Our plastic surgeon, Tiffany McCormack, MD, has once again been featured as a Top Beauty Doctor in New Beauty® magazine’s Spring-Summer 2018 issue! As the chief authority on “everything beauty,” this esteemed publication routinely recognizes individuals who are leaders in the field of aesthetic enhancement. Our team is thrilled that Dr. McCormack has been featured by this beloved beauty powerhouse, which is constantly seeking out the latest advancements in cosmetic treatment, state-of-the-art dermal fillers, anti-aging serums, and everything in between. In the issue, Dr. McCormack advises readers on the ultimate non-surgical enhancement to improve skin tone and texture for a healthy, vibrant glow. Pick up a copy of the national publication, on newsstands now, and read what she has to say about HydraFacial® skin rejuvenation! To learn more about Dr. McCormack and the services she offers, or to schedule a consultation, please contact our practice today.